Fish oil is one of the more common supplements given to dogs and there are many products to choose from. Unfortunately, almost all are fish oils for sale are intended for human consumption and have been repurposed for dogs. This can lead to poor results and can, in some cases, be dangerous. It is important to choose a fish oil that is made just for the unique needs of the canine body. One important consideration for your dog is that he/she can only have a certain amount of EPA/DHA in one day. Tailoring the ratio, and allowing for precise dosage is critically important. HardyPet Premium fish oil is packaged with a liquid pump that provides an exact quantity of fish oil with the right EPA/DHA ratio for dogs. This helps you make sure you are giving your dogs just the right amount of what they need to be healthy without giving them more than they can handle. 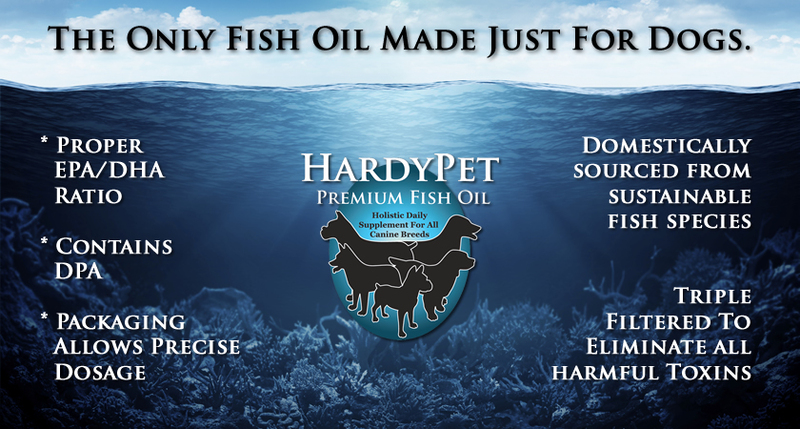 HardyPet Premium Fish Oil is specifically formulated just for dogs. Optimal EPA/DHA balance, The DPA difference, Precise dosage pump dispenser, Triple Filtering for purity and always domestically sourced from sustainable fish species. There is not a better fish oil for your dog. ALSO AVAILABLE ON AUTOSHIP.